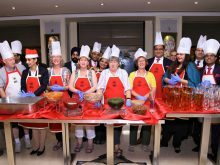 The Suryaa New Delhi recently organised a Christmas cake-mixing ceremony, along with novelist Advaita Kala. The fun and frolic evening began with the invitees mingling with each other and marking the welcome of the festive season. Later, the invitees donned their aprons and gloves and began to pour in the large decanters of authentic ingredients into the big bowls, hence experiencing the fruitful fantasy marking the beginning of traditional cake-mixing ceremony. Everyone enjoyed mixing dried fruits from one end to the other end of the table and ran their fingers through it to ensure that the fruits were ready to be preserved for baking the Christmas cake.